(Newser) – The timeline for the withdrawal of American troops from Syria has gone from 30 days to four months and now to no fixed date, according to John Bolton. He said "certain objectives" must be met before an American withdrawal could happen, the Washington Post reports. 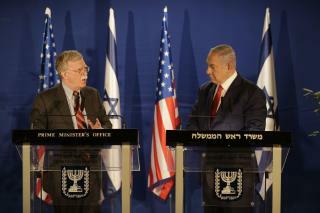 Bolton said there was no fixed timetable and some US troops would remain, at least in the south of the country. When he announced the withdrawal last month, a move that led to the resignation of Defense Secretary Jim Mattis, among others, Trump said: "Our boys, our young women, our men, they’re all coming back and they're coming back now. We won." But on Sunday, Trump told reporters he "never said we're doing it that quickly." Looks like Bolton is next to leave Trump's swamp. This thread has no conservatives in it ...I wonder why? Bolton refutes everything trump as said and says not one is withdrawing. It's a pity trump doesn't read otherwise he would know Bolton is a NeoCon F that has no problem getting our military killed en masse if it make himself and the badger on his top lip look like tough guys.